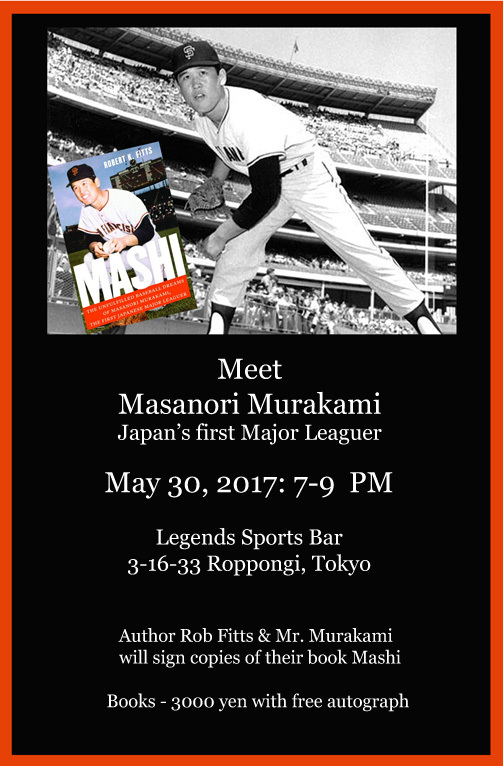 Masanori Murakami, Japan’s first Major Leaguer, and author Robert Fitts will sign copies of their book Mashi at Legends Sports Bar in Roppongi on Tuesday, May 30, 2017 from 7 to 9 PM. Copies of the book will be 3000 yen (cash only) and include a free autograph. Mr. Murakami will sign additional autographs at 3000 yen each. Legends Sports bar is located at 3-16-33 Roppongi.